Home / Latest News / Paraplegic Man Learns Powered Paragliding! All of us at BlackHawk Paramotor USA couldn’t be more proud of Russel Metlitzky – one of our recent students who touched the lives of many through his PPG journey. We would like to thank all those who participated in Russel’s training adventure. Special thanks to Rob & Samantha Whittaker for filming / editing Russel’s training video. Russel Metlitzky was injured in a devastating motorcycle accident, leaving this “extreme sports fanatic” paralyzed from the chest down. With the support of his loving family, and the desire to continue realizing his dreams, Russel ventured into the world of Powered Paragliding. He contacted Mike Robinson with BlackHawk Paramotors after “hearing great things about their training.” Mike was very excited to take on the project and immediately began the design of a custom BlackHawk Paramotor Quad. After extensive testing of the prototype, Russel was invited to the BlackHawk World Training Center in Valley Springs, Ca. Three amazing days later, Russel took his first solo flight. It brought tears and screams of excitement to all those who witnessed Russel take to the sky. Please take a moment to watch our video highlighting this event. Please show your support for Russel by “liking” or commenting on the video. We will forward these comments to Russel directly. After posting the video to Youtube, BlackHawk Paramotors has been contacted by numerous news stations, newspapers, and related foundations like The Wounded Warrior Project. We hope their interest in this story helps to inspire, motivate, and touch the lives of others in Russel’s situation. To start YOUR Paramotor training journey, please give BlackHawk Paramotors a call at (209) 481-0493 or visit the training section of this website. 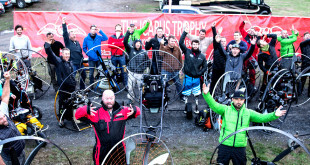 Next BlackHawk Paramotor Seminar is a HIT at REI Sporting Goods!